iOS updates always focus to add some new functionalities to an existing version, but there are always some users who fail to upgrade because their iOS devices freeze during or after the latest iOS update. If you are trying to update to iOS 11.3 and the iOS 11.3 installation gets frozen, then don't worry, we are here to help you out for getting rid of such issue and fix it with easy steps. Through this article we are going to explain the best methods to handle the frozen issues according to the different situations that might have happened to you during the iOS 11.3 installation. 1. If iOS 11.3 installation gets frozen on "Update Requested" or "Verifying Update"
If iOS 11.3 installation gets frozen on "Update Requested" or "Verifying Update"
The first step to install iOS 11.3 is to download and then verify the software. However, this step could be a problem for some people. They may be stuck on 'Verifying Update' or 'Update Requested' screen. There are multiple ways to try in this case. These solutions have their own set of benefits for you. You need to follow the instructions given within each method. The reason for iOS installation being stuck might range from a weak and unstable internet connection to no internet connectivity at all. You can fix this issue on your own. You need to make sure that the iOS device is connected to a strong Wi-Fi network or the mobile data is on, though, connecting over Wi-Fi is recommended. In case you can't access the internet in spite of a proper connection, restart the router, and then turn off and on the Wi-Fi on your iPhone. Restart it and then try connecting to the internet. Now, with a strong internet the iOS 11.3 installation won't get frozen, and your iPhone/iPad/iPod touch will be updated to iOS 11.3 soon and smoothly. You need to wait if the problem persists. Wait for some time and try to install again. In case the problem persists even after the repeated attempts, and displays 'Update Requested' or 'Verifying Update' then you can go for the next solution or simply jump to the solution given in the part 2. If the above two solutions are of no use and your iPhone is now stuck on 'Update Requested' or 'Verifying Update', the easiest way you can try is restoring your iPhone using iTunes. Remember that fixing iOS 11.3 installation frozen issue by restoring the device causes data loss. If you don't want to lose your data, just try the solution in the part 2. 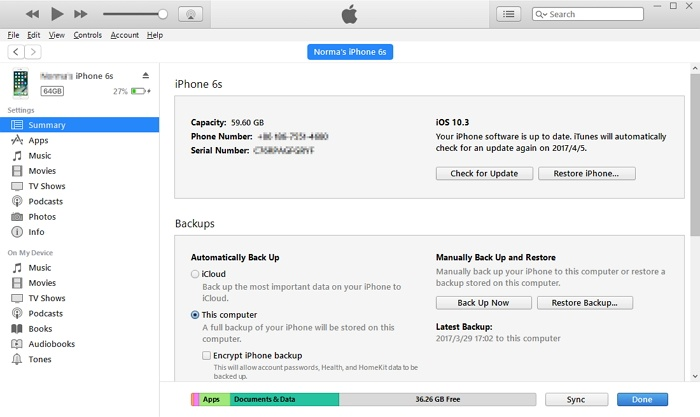 It is important to backup your data prior to initiating the restore process. Let's get started. Launch iTunes on your computer that you generally use to backup your iOS device. Connect your iPhone through a lightning cable. Provide your pass code in case prompted or choose 'Yes' to 'Trust This Computer', by following the onscreen process. From the iTunes main screen choose your device (iPhone/iPad/iPod Touch) by tapping the device name. Then click on the 'Summary' tab, and click 'Restore iPhone' and hit on 'Restore' again to confirm. With this method, we are positive that iOS 11.3 installation won't get stuck or frozen anymore. Some people also meet the frozen issues when iPhone restarts or is being activated. Some may be stuck on Apple Logo with a progress bar and cannot move to the next step. Some also cannot proceed because they cannot activate their iPhone successfully. Therefore we are now explaining how to get your device move forward from Apple Logo with a progress bar or activation screen during iOS 11.3 installation. If the 3rd solution above is not a good option for you as you are afraid of data loss, then iMyFone D-Back is your perfect partner. 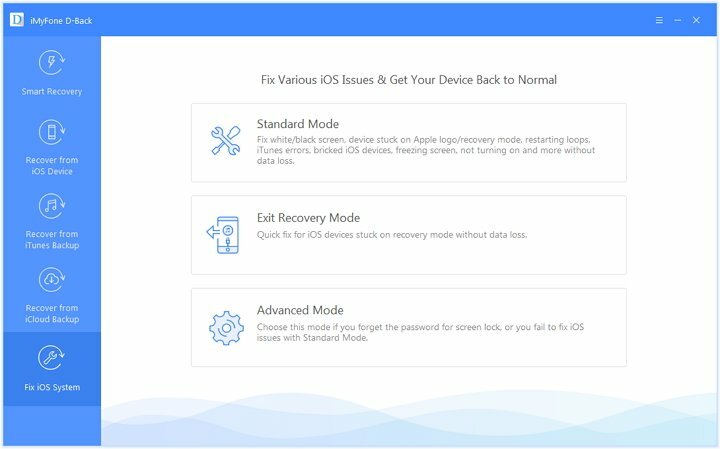 It fixes various iOS issues including your iOS 11.3 installation getting frozen issue. It is actually a data recovery tool and you can use it to recover 20+ types of data from your iPhone/iPad/iPod touch or iTunes/iCloud backup. Here is the step-by-step guide to fix the iOS 11.3 installation getting frozen problem using iMyFone D-Back. Install the latest iMyFone D-Back software on your computer and launch it. Tap on 'Fix iOS System' from the side panel and connect your iPhone to the computer. Select the 'Standard Mode' after that. 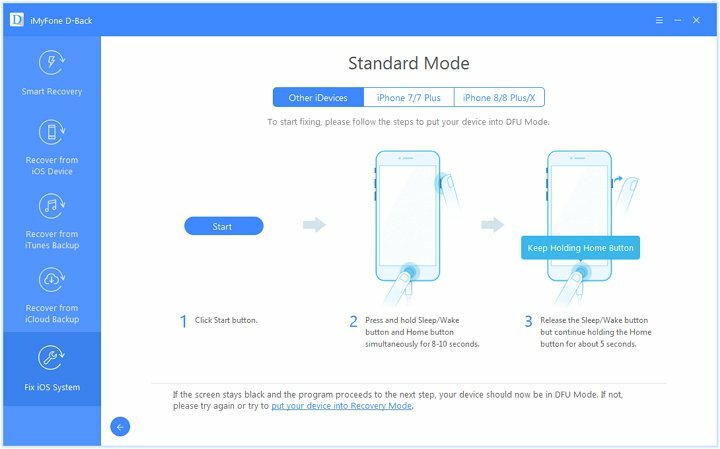 Once you select 'Standard Mode', you will be prompted to put the iOS device in DFU mode. Follow the onscreen process to enter DFU mode or Recovery mode. 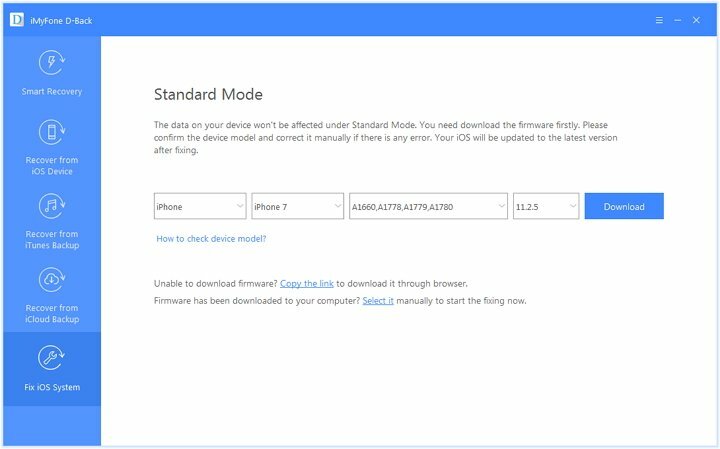 Once the device is in DFU mode, the software detects it and will offer the latest available firmware for your device. Click 'Download' and wait until the process is over. Note: In case the device model is not detected by the program, you can manually enter it. As soon as the device firmware download is over, you need to select 'Start to Fix' and initiate the repair process. The device gets restarted soon and the frozen issue will be fixed.